I tend to wear corals only in spring and summer, so these haven't been getting much love from me lately, but none the less they're still favourites! 1. Dose of Colors lipstick in Play Date - I absolutely love the Dose of Colors lipsticks, which you get get from their website (with international shipping). This colour is a milky coral, quite pale actually, so it's best to wear it lightly as being highly pigmented this can make my lips look somewhat too concealer-like... if concealers were coral! 2. Inglot Lipstick in #104 - this is such a lovely and wearable shade. In real life there's a slight frost to it which I wasn't able to capture in the photo. It's definitely a summer shade, really brightens up the complexion. 3. Shanghai Suzy lipstick in Miss Simone - I was tossing up whether to put this shade in the nudes category or corals, but since the official shade description is "baby coral" then in the coral category it goes. I've just discovered the Shanghai Suzy lipsticks, and I will no doubt be going back for more. 4. Avon Lipstick in Pink Lily - this is definitely not pink, and it's more of a peachy shade but I'm not complaining as the colour is gorgeous. The formula is creamy and quite pigmented too. 5. MAC Lipstick in Costa Chic - This is like a slightly brighter version of #2 (Inglot one). It's again slightly frosted, but it's a bit punchier and again definitely a summer shade. And here are the lip swatches, in natural light with no lipliner. What do you think of my favourite corals? 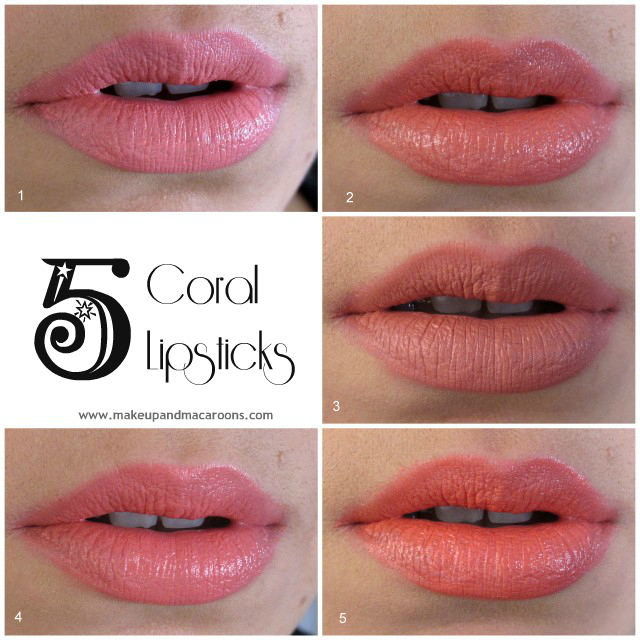 Ooh corals, one of my favorite :), love 2,4 and 5. I love the DOC one, but the Avon is just so soft, pretty and perfect! Love the look of the Avon one! You rock at lip swatches!